Summary: Sierra’s family runs a Christmas tree farm in Oregon – it’s an idyllic place for a girl to grow up, except that every year they have to pack up and move to California to set up their Christmas tree lot for the season. So Sierra lives two lives: her life in Oregon and her life at Christmas. And leaving one always means missing the other. Until this particular Christmas, when Sierra meets Caleb, and one life begins to eclipse the other. . .
As it got closer to Christmas, I started feeling more and more like I wanted a very cheesy, festive, easy read. What Light ended up being just that. As a new release this year, I was eager to pick it up and share my views. Sierra lives two lives, she’s in one place for eleven months of the year and another for one month, and that month is December. She loves both of these places equally, but her life couldn’t be different between growing Christmas trees, and then moving to sell them over the holidays. She’s never been allowed a boyfriend in December, her parents won’t allow her to fall in love with such limited time. That’s until Caleb catches her eye in her final year on the tree lot. There are a lot of rumors about Caleb, but Sierra chooses to follow her heart. First of all, i love a good YA cheesy novel around Christmas time that’s filled with fluff and all things nice. This is exactly what i got. If you’re looking for a realistic romance between two teens, you’re not going to find it here. Admittedly there are flaws with this novel. The falling in love, the friendships, the family dynamics, but it follows through as a very happy, warm Christmas novel. This is the first Jay Asher book i’ve read. I still haven’t picked up Thirteen Reasons Why (i know i should do), but i feel like What Light was a good place to start. It showcases his wonderfully comforting writing. It’s not the most perfect writing, sometimes the characters fall a little flat, and sometimes the plot is a little jumpy. However, it’s exactly what you need to curl up with under a blanket. If you want a book to give you all the feels, all of the time, this is it. A couple of teenagers falling in love as they know they’ll be separated in a few weeks? Yes please, give me all the cheese. As it is set at Christmas time, you also get a great sense of tradition and family and all the things you want to think about this close to Christmas. My favourite parts of the story easy were the little traditions and festive cheer that was spread within their community. I enjoyed this book enough. 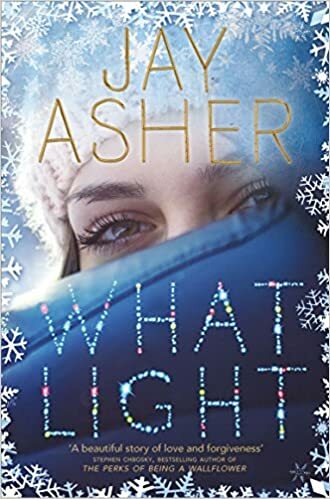 What Light is a calm, wonderful story of one family’s Christmas. I imagine if you’re looking for a more in depth and meaningful Christmas tale, this one isn’t for you.